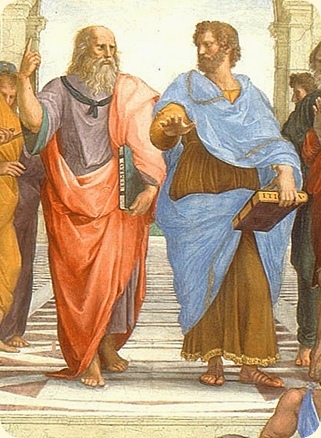 Plato and Aristotle (right). From Rafael's Vatican fresco The School of Athens (1509-1511). As a philosopher Aristotle (38422 BC) is outstanding. He strove to assure the independent role of the deep thinker, yet he became the tutor of the young Alexander the Great, who came to dominate the Greek world later. Aristotle was opposed in principle to Alexander's imperial policy, though. Influenced by Plato, the earliest works of Aristotle were dialogues from when he was a member of the Academy, and in part concerned with thoughts of the next world and the worthlessness of this one. The philosopher Aristotle looks on philosophy as the culmination of civilization - was it because he was a philosopher, one may wonder. Three ancient catalogues list a total of more than 170 separate works by Aristotle. Today, 30 works survive. The lost works include a work in the tradition of Plato's Phaedo; On Philosophy, a work that contains themes that he later developed in Aristotle's Metaphysics; an exhortation to the life of philosophy; another work on Rhetoric. The books of Aristotle that are known today were not at all edited by him. They are concentrated manuscripts, and some of these manuscripts consist of sections that are bundled together by others. "It is not surprising, then, that the Metaphysics and the other works of Aristotle sometimes seem to lack unity or any clear progression of thought, that they are sometimes repetitious and at times even contradictory," says Encyclopaedia Britannica, and also "Aristotle's treatises reveal the philosopher at work. He defines the problem he is to deal with, assesses the views of his predecessors, formulates his own preliminary opinion, considers whether there is a need to modify it in the light of difficulties and objections, rehearses the arguments for different points of viewalways searching, in short, for the most adequate solution or resolution of his problem." Aristotle is in fact "caught in the act" of developing a perspective from difficulties. Many of his assumptions have seemed so plausible that till the end of the 1600s, Western culture was Aristotelian. His mental grasp covered such as literary theory, ethics, and rhetoric. It is held that his historical importance is second to none. The young Aristotle acknowledged Plato's teaching on Ideas. Aristotle later criticized the doctrine of Ideas as inadequate and contradictory. But he continued to recognize metaphysical thought for arriving at the concept of a fundamental great intellect to explain that anything or anyone exist. Aristotle's method was that of explaining. From puzzles or problems his thinking reflects many tentative, and multiform tries at solutions. In this light one may profit from reading Aristotle. Lear, Jonathan. Aristotle: The Desire to Understand. Cambridge, UK: The Cambridge University Press, 1998. Vella, John A. Aristotle: A Guide for the Perplexed. London: Continuum, 2008.